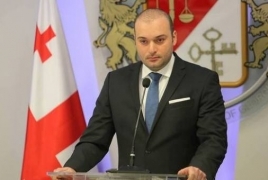 PanARMENIAN.Net - Georgian Prime Minister Mamuka Bakhtadze will pay an official visit to Armenia on Monday, September 10, the government revealed on Sunday. While in Yerevan, the Georgian head of government will meet his Armenian counterpart Nikol Pashinyan. The two are then to release a statement for the media. Bakhtadze will also visit the Armenian Genocide memorial, as well as hold meetings with President Armen Sarkissian and Parliament Speaker Ara Babloyan.